Iota magazine by the Half Litre Car Club (500cc). Homepage. This page: A youthful Stirling Moss looks out from this June 1952 issue of Iota, the Half Litre Club's monthly magazine. Iota - Official Organ of the Half-Litre Car Club. This unusual magazine dates to June 1952, published towards the end of Iota's run. The first issue of Iota was introduced in April 1947, and continued until 1953 when it merged with a magazine called "Motor Racing". 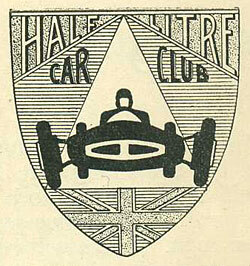 It was the club magazine for the Half-Litre Car Club, a club for devotees of 500cc single seater racing action. 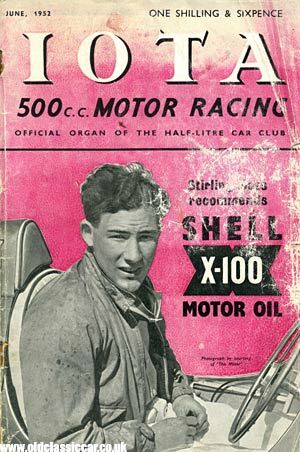 The cover shows Stirling Moss sat behind the wheel of a 500, advertising Shell X-100 motor oil. To buy a copy of the magazine you'd need to fork out One Shilling and Sixpence, or else you could join the Half-Litre Car Club for Eighteen Shillings, and receive Iota in the post. 500cc racing started seriously in 1946, and was seen as an affordable(ish) way into motorsport for those who either couldn't afford, or couldn't find a way, to race in a full-sized racing car. Not that there were many events so soon after the war, with fuel strictly rationed, and pre-war circuits such as Brooklands and Donington very much out of commission. The 500cc racers employed a lightweight chassis, into which a motorcycle engine would be crammed, usually behind the driver. Norton motorcycle engines were a popular choice, and many budding designer/builders cut their teeth on 500s, before moving on to more "prestigious" series, including Formula One. The Cooper Car Company was just one of several small firms who could trace their roots back to 500cc racing after the war. Iota therefore appealed not just to motorsport enthusiasts and spectators, but also to those who actively competed in events, and also to those who built the cars, including the suppliers, and to the sponsors that were by this time making an appearance in motorsport, albeit in a very low-key way. 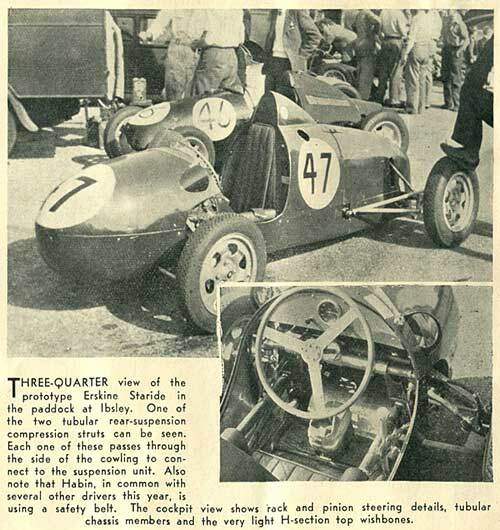 By 1952, 500cc racing was a key element of many weekend meetings across the country, and many drivers who perhaps were more often seen behind the wheel of larger-engined cars, could be found trying their hand in these lightweight racers. The first write-up to feature in June's Iota was the Daily Express Formula 3 500 race at Silverstone, on May 10th. Drivers in this race included Moss, piloting a Kieft-Norton, Stuart Lewis-Evans (the race winner in a Cooper-Norton), Les Leston (of car accessories fame, in another Norton-powered car), and Clive Lones (Iota-J.A.P.) to name just a few. For much of the race Moss led, but on lap 12 was passed by Lewis-Evans, and a lap later by Alan Brown (Cooper-Norton). It later transpired that Moss had been battling mechanical gremlins, in the unwelcome form of partially-jamming brakes, hindering his pace somewhat. As with many articles in Iota magazine, this race review was illustrated with photographs taken by leading motorsport photographers of the day, in Silverstone's case, Geoff Goddard. Photographs by Guy Griffiths, W.K. Henderson, and P.M. Turner are also spread throughout the magazine. Other events and results in this issue, in no particular order. 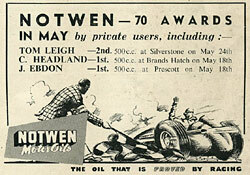 Notwen were frequent sponsors of drivers in the early '50s, their adverts regularly featuring in motoring magazines of the time, celebrating successes by the drivers they supported. One driver was R.D. Poore, and logos for Notwen Motor Oils feature on the lorry I'm having rebuilt. A quick look at the list above confirms just how dominant Cooper cars were in the 500cc events, and on page 5 of Iota is an interview with John Cooper himself. Best known today for the Cooper versions of the Mini, in the early 50s it was as a driver, a designer, and a constructor that he was most frequently associated with. The interview comprised a series of brief questions and answers, casting light on his father Charles' own motor-racing activities (starting out as a mechanic to Kaye Don), and their first joint project - the Cooper 500. By the time of the interview, Cooper reckoned on having built some 300 Cooper racing cars, some with 500cc engines, others aimed at Formula 2 with 1,000cc and 1,100cc units. These F2 cars, although useful in hillclimbs and short-distance events, proved to be unreliable in longer races, hence their decision to then make a 2-litre F2 car with Bristol power (the Cooper-Bristol). Other information uncovered during the interview includes his top choice of circuit - the Nurburgring. According to Cooper: ".. it is the finest motor racing circuit in the world, and contains something of everything". Cooper were not the only manufacturer of these small racers though. Many many companies designed and built their own cars, some proved successful, many achieved mid-field status, and quite a few disappeared without trace after just a single car was built. The 500 Owners Association Ltd website chronicles a huge selection of these lightweight flyers, and is well worth a look (especially the Marques section). One of the lesser-remembered 500s is the Erskine Staride, the prototype of which is shown on page 15 of June 1952's Iota, parked in the paddock at Ibsley. This car had made its debut in April of 1952 at Goodwood. Mike Erskine was the car's designer, built on behalf of driver John Habin who, for 1952, was one of several drivers now opting to use a safety belt for the first time. Prior to getting involved in Formula 3, Erkine produced his own speedway motorcycles of the same name. If anyone has any spare copies of Iota magazine, or in fact any other of the lesser-known titles of the '50s and earlier, please drop me a line. Similar to this magazine, and also from the 1950s, are these two copies of The BARC Gazette.